Adventures in Cookery: Eat Jalapeño, lose weight! This is from a post, I've read recently in "Skinny in the City". "The jalapeño is a type of chili pepper and its burning sensation is hard to ignore. Basically, you know if you’ve eaten one or not. A study published in Clinical Nutrition last year found that capsaicin, in combination with green tea, can help promote a feeling of fullness and aid with weight loss. In addition, researchers in South Korea have been feeding mice capsaicin extracts and finding that it results in lowered inflammation and leptin, a hormone that plays a key role in appetite and metabolism. More investigation is needed on the topic but if spicy food can help my metabolism, sign me up! 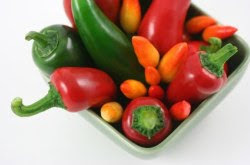 On a much more basic level, spicy foods can inhibit you from eating too much too fast. I’m not saying you should go out to Wendy’s and get their new spicy chicken nuggets or start eating fried jalapeño poppers. But you can enjoy jalapeños sliced over a salad or baked chips with low-fat cheese. You can also grind them into dips, and use chipotle sauce on any entrée to give it heat." Enjoy jalapeno, but don't fool yourself. We are not going to lose wieght with this blog. Marulka is in the house!